Microsoft releases their first Android app | Android Blast! That's right, Microsoft has written an app for Google's Android platform. 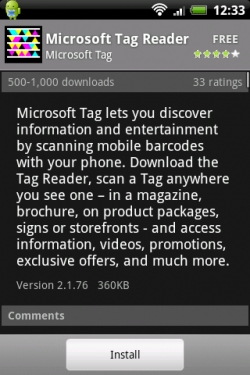 Microsoft Tag Reader allows users to read QR Codes on their Android-powered device. QR Codes are high capacity barcodes that allow users to link back to specific content. Users can use the cameras on their Android-powered phone to scan the QR Code and be immediately taken to a web page, photo, video, etc. Microsoft Tag Reader is available in the Android Market.